Yesterday, a triathlete friend of mine posted a link to a Kickstarter project she had decided to back. I was curious. I had only a vague knowledge about the Kickstarter program, so I decided to check it out. For the uninitiated, Kickstarter is a funding platform for creative projects. Entrepreneurs and artists use Kickstarter to launch their business or career, to get the word out about the thing that is their passion. The way it works is simple. The kickstarter posts information about their goal and then people can pledge money to help them reach their goal. If the project reaches its funding goal, your Amazon.com account is charged for your pledge. If not, there is no charge. I instantly loved that Kickstarter empowers people to make their dreams a reality. How awesome is that? Anyway, Leslie posted about this incredibly awesome new multi-sport, GPS sports watch with a safety alert feature. The watch was designed by two women athletes (a triathlete and an open-water swimmer) who were not pleased with the clunky GPS sports watches currently on the market. They thought they could create something better for women. So, they did. Bia (named for the Greek Goddess of force and power) is a thin, waterproof, infinitely-sizable sports watch with time, stopwatch, intervals, heart rate, and calories burned information. If you want even more versatility, you pair it with the GPS-enabled Bia Go Stick (about the size of an old-school pack of gum). Clip the Go Stick somewhere on your clothing and instantly you add distance, speed, and pace for swim, bike, and run workouts. But, the best feature by far is the audible safety alarm, which will send your location to loved ones and emergency services when you most need help. I like to hike and bike, and I often do it alone. A watch like Bia would give me greater peace of mine about my personal safety, and you can’t put a price on that. In trying to get their product to market Bia founders, Cheryl Kellond and Sylvia Marino, were told repeatedly by investors that the product would not sell because females do not care about their performance and would rather go to the spa. I can’t tell you how much that inane comment aggravates me. While I enjoy a nice massage and pedicure as much as the next gal, I spend most of my summer wondering how many toenails I will lose due to my athletic endeavors. I do care if I improve in my sports performance. It absolutely matters to me if I can increase my speed over the course of a summer as I climb hills on my road bike. I may only be a part-time, amateur athlete, but I am serious about it. I am proud that I am 44 years old and stronger, more flexible, and more fit than I was when I was 24. I pledged to the Bia Kickstarter campaign. 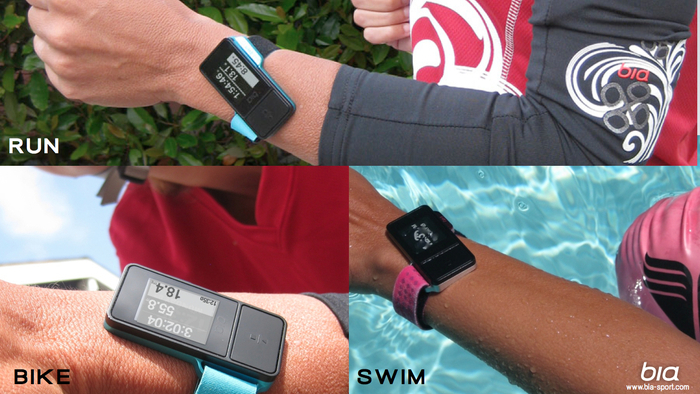 If they reach their fundraising goal by tomorrow morning, next April I will be the proud owner of a Bia Multi-Sports Sports Watch with SOS Safety Alert in turquoise with two, super cute, interchangeable wrist bands and the GPS Go Stick. As of right now, they are approximately $56,000 shy of their fundraising goal. The campaign ends in 12 hours. I am posting this in the hope that some other athletes will see the benefit of a watch like this and sponsor Cheryl and Sylvia’s Kickstarter campaign to bring this product to market at last. At the very least, wouldn’t it be worth it to see a couple female, American entrepreneurs take on Garmin and Nike and those who said it couldn’t and shouldn’t be done and win? I’m all about the underdog. I didn’t get the Polly Purebred nickname I earned in college for nothing.